Austin, TX blues sensation Gary Clark Jr. and his screeching guitar solos roared into Outside Lands on a cloudy Saturday afternoon. Influenced by blues, jazz, hip-hop and soul, Clark's characteristically fuzzy guitar riffs and whining solos are central to his brand of blues. Clark and his band don't perform songs, they jam: Clack opened the show with an 11-minute version of "When My Train Pulls In" from his 2012 record Blak and Blu. A man of few words on stage, Clark chose to let his guitar do the talking. Clark is a musician's musician. 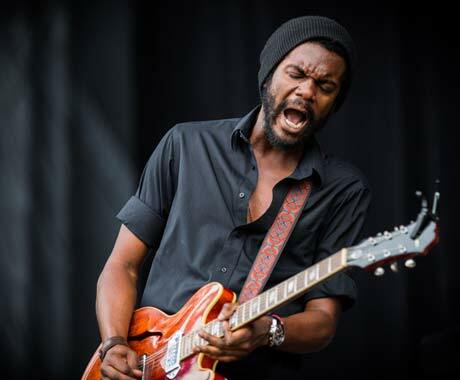 His seemingly impossible guitar skills made it easy to see why Gary Clark Jr. has been referred to as "Best Young Gun" and called "the real promise of the Texan blues." Clark finger-picked his hollow body Epiphone Casino through the entire show, finishing with "Bright Lights." The crowd was moving almost automatically to the funky extended blues sessions. Clark's penchant for rocking out with seemingly improvised rhythm and cadence changes put him in a very elite class of musician.